I was preparing to go out to a concert last week and, searching for a purse, I realized they were all too bulky to hold for 2 hours, or too small to contain my phone, keys, lipstick, etc. With a couple of hours before I had to pick the kids up from school, I decided to whip up a cool clutch. Easy to make but good looking, this clutch can be made in a variety of shapes, sizes, and patterns. It all depends on the size of zipper you have and your own personal style. Total Time Required: 1/2 hour – hour, depending on your sewing speed. Project Costs: about $5 unless, like me, you already have everything in your huge cache of sewing materials and accessories. Because I was wearing burgundy pants, naturally I wanted a purse to match. Luckily, I had some leftover burgundy material, and a complementary patterned material. I also had the zipper and the thread, so it was quite easy to make a quick purse. And, if you’re as fah-bulous as I, you already own a Bedazzler. If not, get on Ebay and acquire one!! First, I found a zipper that I thought would be the perfect size for a purse, and I cut two pieces of material the width of the zipper + and inch or two, and the length I wanted the purse x 2. I chose two complementary pieces of material (one burgundy, one brocade), but you can choose the same material if you so desire. I got out the Bedazzler, dusted it off, and added some studs to one of the pieces of material – the piece that will face outwards, towards the public. I put the right side of the material to the top edge of the zipper, pinned and sewed straight across, as close to the teeth as possible. I then put the right side of the other piece of material to the top edge of the zipper on the other side, pinned and sewed straight across, same as above. I had a zipper sewn in the middle of two pieces of material! 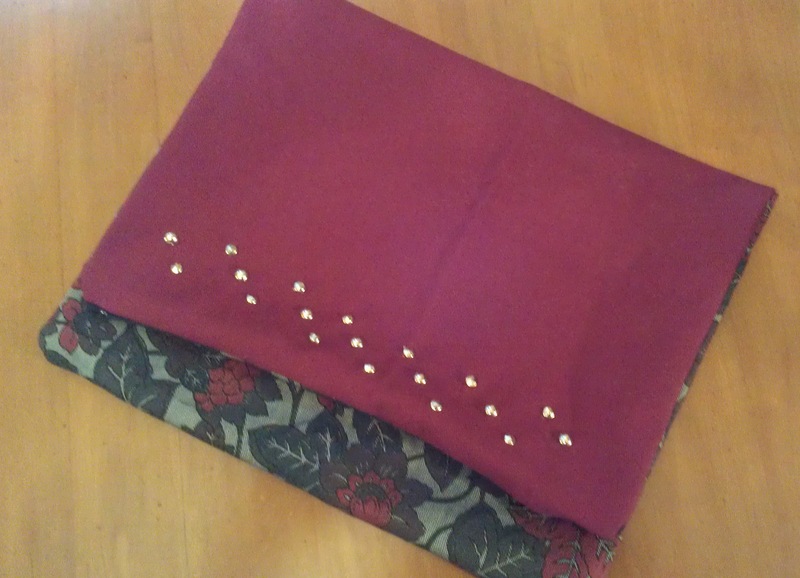 I unzipped the zipper, and pinned the sides and bottom of the purse material, right sides together. My next step was to sew around the sides and bottom of the purse, in a “u” shape, or an open rectangle. I sewed three times around, with the 3rd time being a zigzag stitch. As it’s a purse, I may carry a lot of stuff in there and I don’t want it to fall out because of shoddy workmanship. I pushed the material through the open zipper, poking out the corners, and I had myself a purse! Unzip, throw your stuff in, fold over, and it’s one clutch, to go!